Our preset digital marketing report template will get you started in no time! Track your digital marketing efforts in one easy-to-understand marketing report. Our digital marketing reports let you track organic search traffic, email marketing campaigns, PPC results, and your social media presence all in one spot. It's as easy as signing up and connecting your favourite marketing integrations. We've already selected the most popular web analytics key metrics. You can use our presets or you can choose your own to create a custom report. 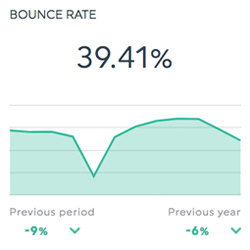 Bounce rate tells you how many people visit your web page and then leave without going to other pages on your site. You can then quickly learn whether your content is pulling people in. 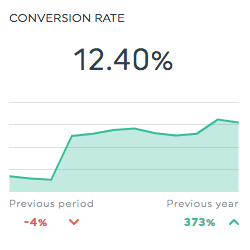 You can measure your campaign performance using preset metrics, including cost-per-click (CPC), click through rate, conversion rate and revenue. Traffic source tells you how people got to your website. There are a few different traffic sources, including organic traffic (through a search engine), social media traffic (through a social media site like Facebook or LinkedIn), PPC traffic (clicking on a paid ad), referral traffic (clicking a link on another website), or email traffic (an email newsletter or mailing list). Conversion rates are where the rubber hits the road for digital marketing. This measures the percentage of people that achieve a desired goal on your website (e.g. a purchase, signing up for a newsletter). Google Analytics goal completions (conversions) measure how well your website achieves predetermined objectives. You can set different goals depending on what you want to track. There are a few different metrics you can use to gauge the performance of landing pages. Common KPIs include total visits, average page views, pages per visit, and bounce rate. Want to display your key metrics with our marketing report template? It's as easy as connecting your own digital marketing tools to DashThis, and then choosing from among our preset report templates! You can start by using a free template for 15 days. Google Analytics, Google Adwords Facebook Ads & all your favorite data sets can be connected in seconds. Choose the Digital Marketing Report template from the drop-down menu, and you’re all set! From paid search to SEO to email, to social media, our reporting tool connects with the most popular digital marketing integrations including Google Analytics, Google Adwords, LinkedIn, Google Search Console, Bing Ads, and many more! Display your own data with the perfect digital marketing report template! One marketing reporting tool. All the features you need. Thousands of digital marketers trust DashThis' digital marketing reports. 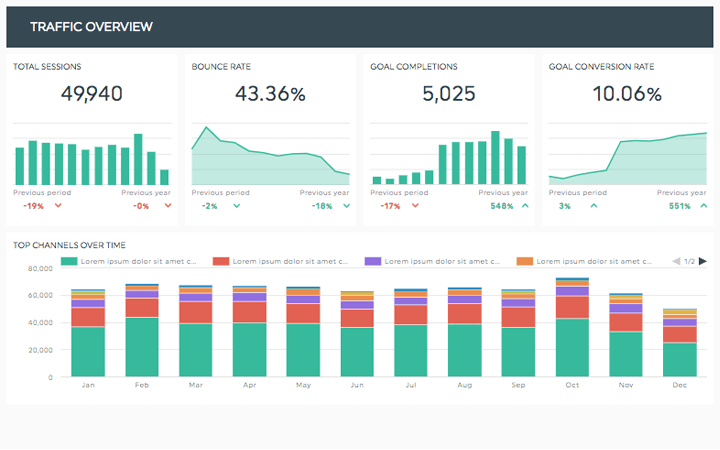 We know what digital marketers want and we've built our reporting tools to reflect that. Invite your whole marketing team to collaborate on your marketing reports. Display your data just how you want to. Use our custom widgets to create beautiful data sets you can show to your clients. Our marketing report template can be customized to reflect your branding. You can add logos, fonts, colours, and a custom URL. 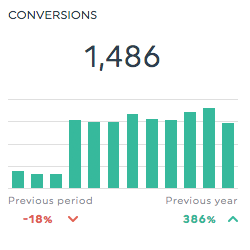 No matter what kind of marketing report you’re creating, DashThis simplifies the process! Keep your content marketing campaigns on track using our content marketing reports. They'll tell you exactly what you need to know so that your campaigns perform well. Make sure your SEO strategies are bringing in customers using our custom search engine optimization reports. Creating a report for a CEO or marketing executive? Don't overwhelm them with pages of numbers. Instead, use our executive report template to give them the key stats they'll be interested in. Keep a handle on your inbound marketing data using our inbound marketing reports. You can pull data from multiple platforms into one comprehensive report. Who wants to spend time calculating sales numbers? Let us take care of that for you so you can spend more time adding value for your clients. Our client marketing reports let you create custom reports for your clients so you can show them how their digital marketing campaigns are going. Choose from a wide range of reporting templates; one for your every need and marketing specialty! Optimize your campaigns and track your success. Our comprehensive social media marketing reports will help you stay on top of your social media campaigns. Display your Google Analytics data exactly the way you want. Whether it's sessions, conversions, landing page performance, or bounce rate, our report templates can cover it all. Track the success of your email marketing campaigns. Our email marketing reports can handle all the KPIs you throw at them.